Gentlemen, The Fall/Winter season is upon us, which means it's time to put away the light coloured clothing and embrace the deep rich tones and textures of this years men's Fall fashion. We're excited to create you some stunning custom clothing from the vast F/W fabric collection, which is filled with rich colours, patterns and textures that we're loving! Our favourite colours for suits, sport coats, trousers and formal wear this season, are burgundy, deep purple, rich blues and fifty shades of brown. Classic Navy Blazer - Every fellow should have one of these in their collection. Rich Brown Trousers - A go-to classic in the Autumn season. Steel Blue Suit - The go-to power suit for every Gentleman's wardrobe. Get more use out of your wardrobe and wear the suit trousers with your sport coats. This colour mix can be worn with almost any colour of trouser or dark wash jeans. The go-to sport jacket that is perfect for jeans and casual trousers. A velvet dinner jacket is one of the best investments you can make for your F/W wardrobe. It can be worn to semi formal and formal events, as well as Holiday parties! Oh, and it never goes out of style. We have a collection of in-stock velvet jackets, as well as fabrics to make your own custom jacket. 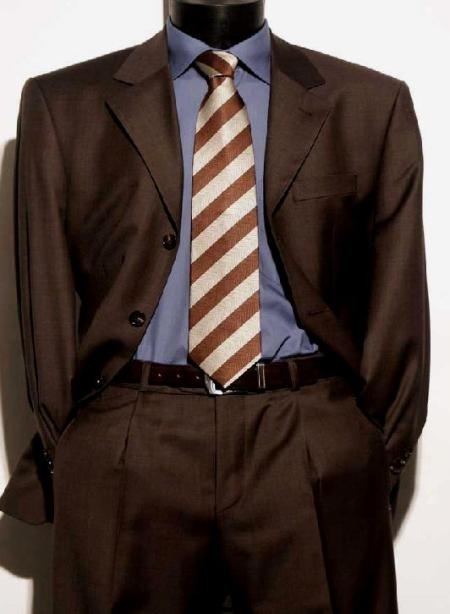 We haven't seen a lot of brown in menswear for some time now, as it was drab and unflattering, because the style of men's fashion was big, baggy, double breasted and pleated! Case in point. Just NO! But the browns we're seeing this year are both rich and muted and often complemented with contrasting patterns and colours. And thankfully the trend of men's clothing is still trim and tailored, which typically makes almost any colour or pattern look more flattering. This is the perfect colour to ease yourself into adding brown to your wardrobe. A jacket like this is fool proof, because it can be worn with almost every colour of pant, which can also be worn casual w/ pants or dressed up w/a pair of dress pants. There has been a slow resurgence of the double breasted suit jacket, and it is far more tailored and fitted, compared to the ill-fitting 90's version of the baggy double breasted suits. We're a fan of the new version, if it's done right, like the dapper Tom Hiddleston in this photo. Our Coppley Custom Clothing Event is a great time to revitalise your Fall wardrobe and introduce some rich new colours and maybe new styles, such as a double breasted jacket or vest into your collection. Visit us at our studio in downtown Vancouver to check out the seasonal in-stock collection, as well as a wide variety of swatches available for custom clothing. Email or call today to reserve your spot for a complimentary consultation.